G-CAS! Sew Excited! : Wardrobe Building Challenge PeriCrafters! I belong to a Facebook group called PeriCrafters. What we do is Periscope (live video) about crafts, DIY, sewing or anything creative. It's a great group and easy to get hooked on. There are a lot of captivating women and powerhouse sewers with lots of information to share as well as talent! So, although I find it's taking up a bit of my time - at least I'm learning something and my sewing MOJO hasn't taken its usual DIVE! Plus I love the Cam-A-Rah! Scoping is fun! If you sew or craft - join the group!! Sooooo - I'm helping with the August Challenge! It's is a wardrobe builder! Now, recently I got in a Pattern Review contest for a wardrobe but it's a little loud (to say the least) although I do love it, this time I'm toning down the color a bit but it still has that busy flare that I so love. And the pattern is quite easy to sew up QUICK! 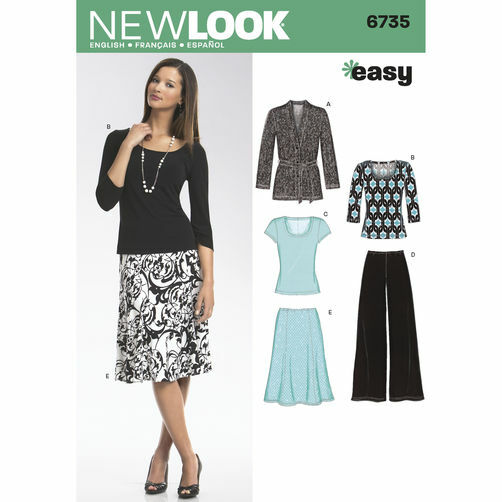 Here is it New Look 6735. Anyone joining in the fun can use this pattern as well as picking a similar wardrobe pattern or many separate patterns. As long as you are sewing a wardrobe or wardrobe building pieces. Fair enough!! Here are my fabrics I'm going to be using for this challenge. I'm also adding a dress (the stripes). I'll be blogging my progress so stay tuned! The facilitators are spearheading a project each week of this month. And here we are listed and Fabulous. Yea, I said WE! I'm help'n out! Ila is doing the Skirt this week and she will be on Friday (Aug 5), Andrea is doing the Shirt next week, I will be doing the pants the third week and Myra will close out the month with the cardigan. I even got my skirt and first shirt cut out and ready to sew! It's the only way I stay on track. Challenges help me keep my sewing focus (sometimes). I need guidance FO REAL!! Anywhoooo! Join us - we're happy to have you and these ladies are BAD AZZ!! Follow them all on Periscope and follow me on Periscope too, if you don't already! Heeeeey Carol! This sounds like so much fun. I love how each piece is being sewn by a different sew sister. So how does this work? Do we watch on periscope or your blogs? You know I still haven't fully figured out how to use periscope. LOL! I'm gonna get it one day though. You can watch on Periscope and the individual blogs. I have included our handles and links above! When your phone "tweets" open the app and press the Live video stream! LOL!! You betta join!! Nice fabric choices Carol and great post! Thanks Ms Faye! This is actually keeping me sewing focused! LOL!!! Alright now Ms. Char!!! You are a sweetie!! !